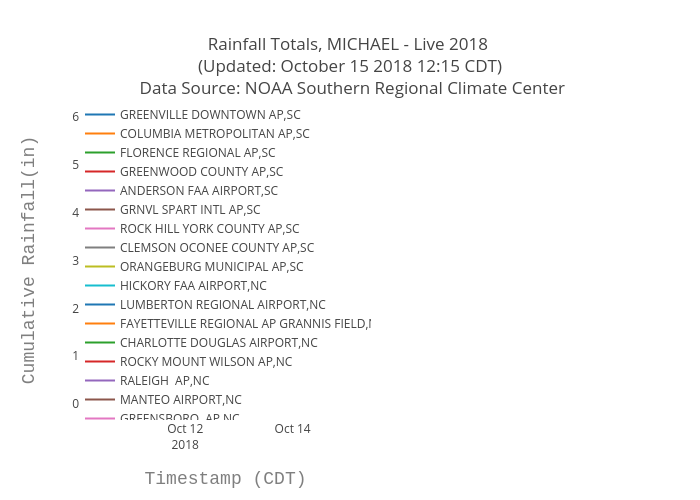 Bigdata153's interactive graph and data of "Rainfall Totals, MICHAEL - Live 2018 (Updated: October 15 2018 12:15 CDT) Data Source: NOAA Southern Regional Climate Center" is a scatter chart, showing GREENVILLE DOWNTOWN AP,SC, COLUMBIA METROPOLITAN AP,SC, FLORENCE REGIONAL AP,SC, GREENWOOD COUNTY AP,SC, ANDERSON FAA AIRPORT,SC, GRNVL SPART INTL AP,SC, ROCK HILL YORK COUNTY AP,SC, CLEMSON OCONEE COUNTY AP,SC, ORANGEBURG MUNICIPAL AP,SC, HICKORY FAA AIRPORT,NC, LUMBERTON REGIONAL AIRPORT,NC, FAYETTEVILLE REGIONAL AP GRANNIS FIELD,NC, CHARLOTTE DOUGLAS AIRPORT,NC, ROCKY MOUNT WILSON AP,NC, RALEIGH AP,NC, MANTEO AIRPORT,NC, GREENSBORO AP,NC, WINSTON SALEM REYNOLDS AP,NC, GASTONIA MUNICIPAL AP,NC, MONROE AIRPORT,NC, BURLINGTON ALAMANCE REGIONAL AP,NC, LAURINBURG MAXTON AP,NC, ELIZABETH CITY COAST GUARD AIR STN,NC, ASHEVILLE AIRPORT,NC, WILMINGTON INT'L AIRPORT,NC, CAPE HATTERAS - BILLY MITCHELL FIELD,NC, CRESTVIEW BOB SIKES AP,FL, TAMPA INTL AP,FL, CROSS CITY AP,FL, GAINESVILLE REGIONAL AP,FL, WHITING FIELD NAS,FL, MARIANNA MUNICIPAL AP,FL, DESTIN FORT WALTON BEACH AP,FL, APALACHICOLA AP,FL, TALLAHASSEE REGIONAL AP,FL, ST PETERSBURG CLEARWATER INTL AP,FL, PENSACOLA REGIONAL AP,FL, JACKSONVILLE INTL AP,FL, WHITING FIELD NAS SOUTH,FL, NORTHWEST FLORIDA BEACHES INTL AP,FL, ST PETERSBURG ALBERT WHITTED AP,FL, TYNDALL AIR FORCE BASE,FL, PEACHTREE CITY FALCON FIELD,GA, VALDOSTA REGIONAL AP,GA, ALMA BACON COUNTY AP,GA, ALBANY SW GEORGIA REGIONAL AP,GA, FORT BENNING LAWSON FIELD,GA, COLUMBUS METROPOLITAN AP,GA, MACON MIDDLE GA REGIONAL AP,GA, ATLANTA HARTSFIELD INTL AP,GA, ATLANTA FULTON COUNTY AP,GA, ATHENS BEN EPPS AP,GA, ROME R B RUSSELL AP,GA, GAINESVILLE LEE GILMER MEMORIAL AP,GA, AUGUSTA BUSH FIELD AP,GA, CARTERSVILLE AIRPORT,GA; with Timestamp (CDT) in the x-axis and Cumulative Rainfall(in) in the y-axis.. The x-axis shows values from 0 to 0. The y-axis shows values from 0 to 0.